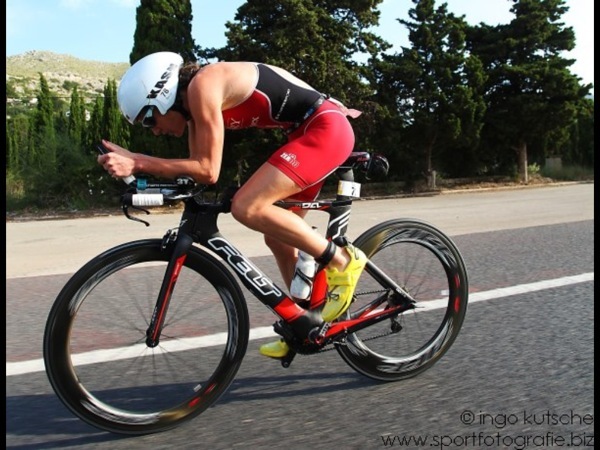 Ironman 70.3 Mallorca - A Storming Start to the Season! This weekend saw my first race of the season in one of my favourite places to train. Mallorca - the Spanish island of Sun, Sea, Mountains and endless Cafe Cortados. I went into this race with a good block of training under my belt - consistent and injury free and with a heightened focus on nutrition. I have been working with Tom Bennett of T2 Coaching since Christmas and things were progressing well. Tom has an incredible knowledge of physiology, and being a tech geek, loves his data sheets and Training Peaks analyses. I probably train less hours then I ever have done as a Pro now, but it is all quality, focused work and it appears to be working for me. Having a coach that is local to where I live in London is invaluable. I travel to train and race frequently but always have a few weeks a month where i'm in the UK and Tom sees me 2-3 times a week. Run sessions, with form analysis and reinforcement, and similarly in the pool. I used to think to be a good runner I needed to run ALOT. Tom has challenged this myth. Form, Strength and quality work with plenty at threshold pace is what has seen my run make a jump forward this year. I also have a new bike thanks to the support from Pearson Cycles. A stunning, super aero Felt DA1. Stuart at the Sheen branch of Pearson's dialled in my position to perfection - aero yet comfortable. See more on the bike from this recent Tri247 article. It was somewhat hard not to be intimidated when you glanced at the Pro list for this event. Ironman winners, European Champs, sub 9 Ironman finishers all in the women's' field. I have raced this race twice before - In 2011 I finished 6th and in 2012 I swam/biked only (3rd off the bike) as i had a healing stress fracture at the time. This was the strongest Pro field the event has ever attracted, which is testament more to the fantastic course than anything else. I was a little late to the swim start - no surprise there, those who know me would say. Myself and an friend racing age-group where searching for the damn Bag Drop. No signs. Slightly stressful. A quick dip in the sea as the commissaire was calling for the Pro's to line up. I usually like a 5 min swim warm up in addition to a 10min jog/stretch/strides warm-up. Today I would have to settle for 2mins. Getting the face in the water... a few sprints with high arm turnover - 20 strokes using fists only - gives me a better feel for the water and out onto the beach for the line-up. I always make sure my shoulders and lats are nicely warm before the swim with some on-land arms swings/or swim cords sometimes. Restriction around the shoulders from the wetsuit hinders the range you get in your stroke, so I pull the wetsuit up around the armpits/shoulder (bent over at the middle - pull up from lower waist). I was pretty calm for me at this swim start. In 2012 I really struggled to get a groove in the water or make any progress in my swim. It took Darren Smith (@coachdaz) to point out that I was swimming catch up all the time for me to overhaul my technique and practice practice practice. Going into this race I have had increasing confidence in my swim as pool and OW times were significantly faster. Practising visualisation - I tried to emulate how I felt at the Age-Group World Champs in 2009, at which I won a Gold Medal. I was first out of the water and lead from start to finish. The swim was similar conditions - beach start etc. The fear is always that with a dive start your goggles will come off. I find if you keep the eye-line slightly up it lessens the chance. I lined myself up with Lisa Hutthaler - an Austrian triathlete whom has recently returned to our sport having served a 2 year ban for EPO, Steroids and Testosterone misuse - in addition to receiving a court penalty for 20,000 for attempting to bribe a lab official to hide her positive result. 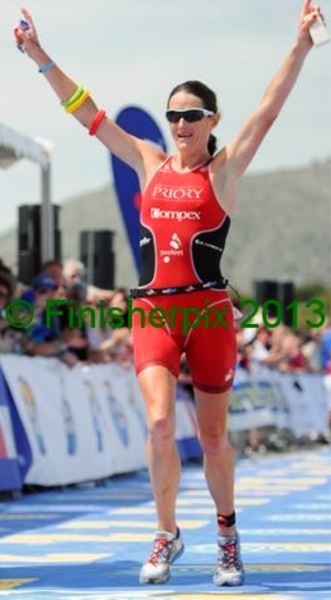 I knew from racing Lisa at the end of last season in Ironman Aix-En-Provence that I was capable of swimming with her now. We started alone - 20 or so female pro's - uneventful start - run in dive - washing machine - high pace to the first buoy. I was catching male pro's (who started 2 minutes ahead of us) so I knew I was swimming well. Before I knew it (usually the swim seems to go on forever!) I was hat/goggles off and running onto the blue carpet. I heard my name shouted and that I was in 4th place. I had no idea of the time or of the gap to the other girls but I knew from here it was game on. Process Goal 1 achieved - to have a solid swim with good catch and high stroke rate, reflecting gains made in training. Loooong T2 as many of you may have heard. close on 800m from the sea to the bike. Wetsuit down to the middle.. Jog through. Out onto the bike. In the first 500m going over a road hump I lost my rear bottle continaing 3 gels and water - Damn - 1/2 my nutrition gone. I'll never use a 'rocket launcher' again! I could see that one of the Erdinger athletes was ahead and I focused on reeling her in. As I did this, Lisa Huttlhaler, came past like a steam train. To be honest I didn't think it was a female pro at first for two reasons - the speed and the size of the leg muscles.. but a glance at the bib gave it away. Damn. I caught and passed German Natscha Schmidt (who finished 3rd last year) and she stayed with me for some time. At the bottom of the long climb up to Lluc I caught Daniela Sammler and still had Lisa within sights. I started to feel a bit better. I love climbing.. and I know the climb on the race well. Then the familiar white SkinFit outfit of Yvonne VanVlerken came storming past. Big Gear - mashing it up the climb. I went with her... sitting legal distance behind for a while. 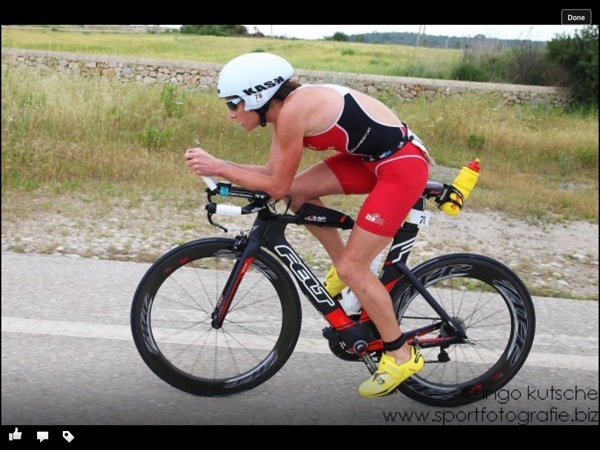 Soon we came upon Lauren Groves (Canadian Olympian who lives out in Mallorca now) in her first 70.3 distance race and then Brett Sutton coached Rahel Kung (young swiss athelte) - both incredible swimmers. At this point I was thinking - who else IS there out on the road? What position am I in? I shouted to the camera man passing and he said you are all together now.. and before long I saw Anja Beranek just ahead. Anja went into this race as favorite, having won the European Champs last year, putting 8minutes into our Brit Duracell Bunny - Lucy Gossage. We'd all expected her to be well ahead by now as her famed biking usually sets her apart. On a steep part of the climb, I passed Anja. Lisa was close by and hung on to me. Then I heard the WHOOOMP WHOOMP of a disc and there was The Goss... also mashing a big gear. I said yep, looks like I am, feeling an adrenaline surge at the same time. Any laurels were not rested upon more than a few secs as Lucy took the lead and I remember thinking - damn she is strong. But I found another gear and fought back. Coming to the top of a section of the climb before some undulations I went passed Lucy (think she got stuck in the small ring) again and pushed hard to the last corner where the road ascends again 2k to the pertrol station. Descent - A technical descent with a number of switchbacks. Riding down on a TT bike with uber narrow bars (see 3T Brezza Nano) that i had only been riding for a week with an integrated back brake which was on the loose side to prevent rubbing - was a little disconcerting. Yvonne caught up and went past like her namesake the Flying Dutch. Save for Nicola Spirig, I have never seen a woman descend so beautifully. Nerves of Steel I thought. Lisa also went past and Lucy was just behind. So.. spurred on by the Goss I found a dose of HTFU and tried to keep Lisa in sight. At the bottom of the descent I could still see Lisa 200m up the road. I caught and passed a male Pro - Steve Osborne riding in VOTwo kit. He hung on to me for quite a while... but Lisa was moving away. I then was out on my own... no one in sight in front or behind. No-Man's Land! I kept pushing and then coming out of a corner switched gears from small ring - big at back to big ring... and back chain slipped off. Pressed the gears back and forth... nothing - spinning free air. Damn! I pulled up and stopped. The chain was stuck between the frame and my Rotor ring. this has happened before on another bike and I remember it taking ages to get out. Swearing at my stupid gear changing and letting my mind wonder off into "Typical.. this always happens to me - mechanicals ruining the day"... I was soon tearing at the chain and boom it came loose. Managed to slice my hand deeply on the chain-ring doing so, but hey, whats a race without blood, sweat and tears! The VOtwo chap caught back up and he rode ahead for a minute, before I passed him again. And there he sat - with one other male pro. Getting back into a rhythm... pushing on then - again the SQUEAL! "What the feck do you think you are doing? Drafting off a female Pro? You should be ashamed of yourselves!" I had to smile - I can't fault Lucy for speaking her mind. The Duracell bunny was back and on a mission. The noise of her Lightweight Disc preceded her, and she passed me once again, pushing the same massive gear. I held on for a bit and then passed again.. and we stayed close together - accompanied by a camera crew and draft-buster until T2. I felt a little tired in myself in the last 30mins on the bike and knew this is when i needed the gel I'd lost. LOVED coming into T2 with all the cheers and roars of support - Thank You all! Uneventful transition, but I'd left my Garmin 910XT on the bike, and there was no turning back - I would again be guided by feel on the run. As I fiddled with my shoe tongue Lucy caught me and we ran out of T2 together... through the tunnel of the crowds... this was exciting - this was racing! I stayed by Lucy's shoulder - literally as she later said, breathing down her neck for the first 2k. Then I felt my breathing slightly increase and knew I had to dial it in a little. Lucy gapped me. 5 seconds, 10 seconds... I could see the pink CompressSport calf guards disappearing into the distance. It was at Km 5 that I really started to feel the effects of only having 4 gels on the bike (and water only) - usually I would have 6 - included one caffeinated one - which I lost from my bike when I stopped to fix chain. I had one in my run bag - a PowerBar new AquaGel which I swallowed down over the next few mins. Started to feel better - pick up the pace. Turnover, relaxed shoulders - quick feet (thanks @troymaloy). I was running well. Lucy was staying at the same distance ahead. I then saw a girl in Bedford Harriers gear - Gillian Fullen I was later told her name was. She was an Age-Grouper but running really well... it took me a while to reel her in and when I did I said " you're running really well" she said "so are you... " to which I replied that I was a Pro. "Come on Then!" she spurted and proceeded to almost sprint for the next 100m - I smiled and just kept going.. Loved her attitude. At this point I was running with Crispin from Thames Turbo whom I asked if he had a spare gel - he did and again it perked me up a bit.. even if I just kept it in my mouth! Before I knew it - the last lap approached and Lucy was still the same gap ahead. The 3rd lap got very busy with runners and someone else was wearing pink calf guards ahead - I figured I was catching Lucy - but she was well gone and soon I was told this.. that the gap had widened. I knew at that point I wouldn't catch her - but if i'm honest - I never thought I would. I just ran controlled all the way - with a few lulls due to lack of fuel. The finish line was in a different place from last year and further away than I thought. It was fantastic running through the crowds with the cheers of support and onto the finishing shoot. I finished strong in 4th with Lucy, Yvonne and Lisa up front. Yvonne had dropped off the pace in the last lap and LH ran through her. This surprised everyone as Lisa isn't known for her run strength. I crossed the line, happy, contented and feeling ok - usually i feel like I need a lie-down! I had a slightly emotional hug with Goss and she congratulated me on upping my game and pushing her to the line. This was the first half-marathon off the bike thats i've done where i thought i could keep going - in hindsight perhaps this means I should have pushed harder - or have had the confidence to run longer with Lucy, but I know nutrition let me down and also i'm redefining my limits. Progress. Good Swim - within limits. Bike - Strong (best point crossing Lluc climb in the lead) - Mechanical AGAIN. Must work on this. Chain catcher to be employed. - Losing fuel on the bike (in bottle) not ideal - affected late stage of bike and run. Run - Progress. Ran with strong form for most. Lack of nutrition at end of bike played its part as ran slower on last lap. I also lacked the confidence to push to get closer to Lucy - 5th behind was 2+ minutes. Will take confidence from this race. Training smart is paying off. The after-party of this event hosted by http://www.blacklinelondon.com/ was superb! I allow myself a couple of post-race big parties a year and this was one of them! Many of their athletes raced, so we had plenty to celebrate. Myself, Mark Threlfall and Michael Collins (@MC_UrbanCrew) and the TriCamp crew were amongst the last on the dance floor at 4am. Good times. Ironman 70.3 UK - one of my favorite races - that I haven't been able to do for 2 years due to injury! A HUGE thank you to my sponsors. and to Tom (www.t2coaching.com) for believing in me. "Without a struggle there can be no progress".